Though without a doubt one of the finest animation studios in the business, Pixar had a minor slip up last year with their sequel to the popular 2006 flick Cars, which garnered mixed to negative responses amongst critics and audiences alike despite it's strong box office takings. 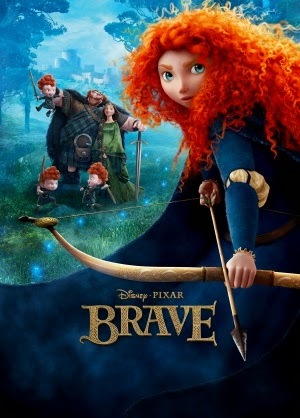 After two previous years of sequels to existing Pixar projects, the subsidiary of Disney has brought us their next original creation: Brave, a fantasy adventure set in the mythical highlands of ancient Scotland. The plot revolves around Princess Merida (Kelly Macdonald), the firstborn of Dunbroch rulers King Fergus (Billy Connolly) and Queen Elinor (Emma Thompson). With her whole life planned out for years against her own will, Merida opposes the wishes of her traditionalist mother and the old age custom set in place as a status quo for centuries by consulting a secretive witch (Julie Walters) and crafting a spell to change her fate, inadvertently causing chaos and discord in the kingdom which she must now put a stop to before everything dear to her is lost. Those who have been following up with news of the film may know that Pixar rewrote their animation software for the first time in 25 years to develop the most breathtakingly photorealistic animation possible, providing audiences with a vastly rich visual experience. The graphics excel the standards Pixar has set for themselves, with the historic highlands of Scotland crammed with detail and colour, with intricate, imaginative designs injected into the overall visual style to create an undeniably beautiful fantasy setting. The effortless and fluent character animation breathes a huge wave of life into their appearance, making them more than CGI models as is usually the case with Pixar, and the added 3D effect is a decent inclusion even if it doesn't provide any noticeable eye popping moments. To judge a Pixar film by the subjective 'Pixar standards' is indeed pretentious, but it's a fair enough gesture at times to use it a critical basis; in the case of Brave, the standard is met to an extent but the film is lacking in specific areas and sometimes reeks of disappointment. The history developed in this fictional landscape and culture is actually thoroughly enjoyable and interesting, paving the way for some dramatic elements to the story and providing clever exposition, but the main problem with the narrative is pacing. The film moves at a relentless pace, often giving little time for important character development beyond the protagonist Merida and her mother, and culminating with an underwhelming if entertaining climax with a weak, underdone villain. It's by no means bad, however; the story has a good bulk of drama and emotion, and is also very well supported with a fantastic sense of humour: I have no shame in admitting that Brave is Pixar's funniest film to date. The story is backed by a strong voice cast of British talent, including the aforementioned Kelly Macdonald (replacing Reese Witherspoon early on in production) who provides a well rounded vocal performance for our main heroine, inducing her with the emotional strength and confidence that makes the character who she is. Billy Connolly clearly has a lot of fun with his character, making him one of the film's funniest, and Emma Thompson conveys the strict but sympathetic and caring nature of her character and proves to be a very memorable actress in the film, despite being absent for a large amount of it, also providing a very good Scottish accent. The cast of supporting voice actors includes famed Robbie Coltrane, Kevin McKidd and Craig Ferguson, all of whom play their respective characters with a charming charisma. Brave is a strong effort from Pixar, and proves the studio hasn't lost it's touch even if the film isn't as good as some of their previous projects. A much less commercial and lazy outcome than last year's Cars 2, the film succeeds in crafting a well rounded story with emotional depth and a fantastic balance of humour, and is a must see for fans of the undeniably brilliant Pixar canon. As is usual with Pixar, a short film titled La Luna shows before Brave; original, beautifully animated and vastly entertaining, the short is easily one of Pixar's most endearing.